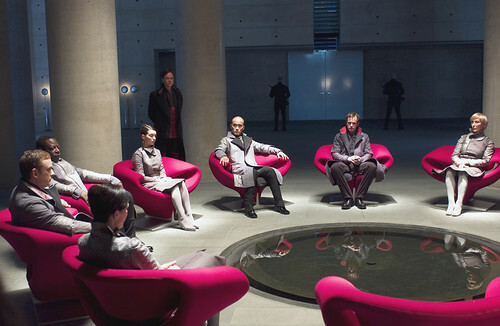 « Whatever happened to the seating platform, the conversation pit? Obviously modern architecture is still space-age in the popular unconscious, and not only space-age but on some level its aesthetics and utopian aspirations are clearly under suspicion. 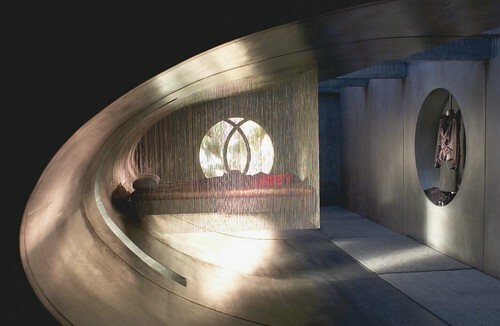 A friend of mine pointed out that in Hollywood it’s always villains who have the best taste in architecture and decor, and this is especially true in science fiction. I can never decide if this phenomenon—good design is evil—is due to well-founded skepticism or some sort of Puritan conservatism, or both. Like the biosphere society in Logan’s Run, the future city of Bregna was purportedly built as a utopian haven but quickly reveals itself as a dark dystopia, its impressive architecture quickly taking on a stifling totalitarianism. 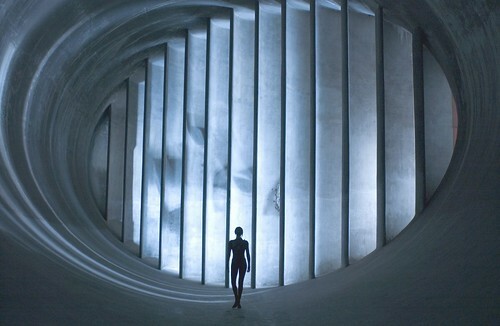 Much of the information about architecture in Aeon Flux in this post came from a long thread on architecture in film on pushpullbar, as well as from OCD fan websites here and here. There’s also an entertaining discussion here which tries to pin down the film’s architectural style and historical references. 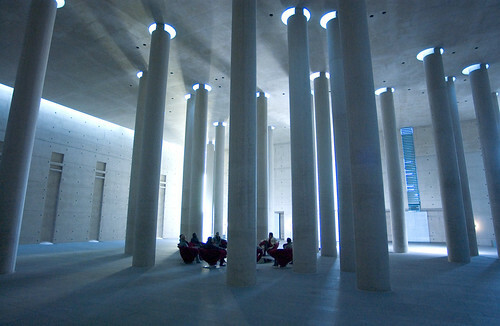 The photos above show the interior and exterior of the Baumschulenweg Crematorium of Alex Schultes and Charlotte Frank, which served as the ruling regime’s HQ in the film (note the Pierre Paulin ribbon chairs, in fuschia). All photos are from Paramount via here. Update: suggested walking tour of Berlin architecture via the Guardian. Above, familiar from the film’s poster, is the now disused 1935 Berlin Windkanal or aerodynamic testing windtunnel for German aircraft, built in 1932 and now designated a technical landmark. After WWII the Soviets removed all the equipment, leaving only the tunnel behind. 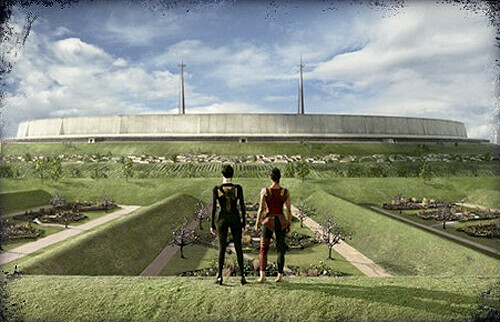 It stands in for the “maze” and government complex in the film. The Benjamin Franklin Conference Center Kongresshalle, above, by Hugh Stubbins with Werner Düttmann and Franz Mocken, 1957. It’s been renamed House of World Culture, but Berliners call it the ‘pregnant oyster’. 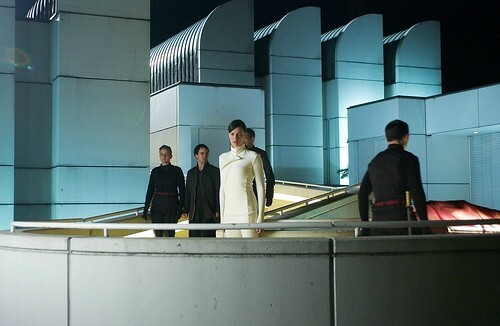 Its roof, which has been rebuilt after a collapse in 1980, is the setting for a nighttime battle between Aeon and guards. 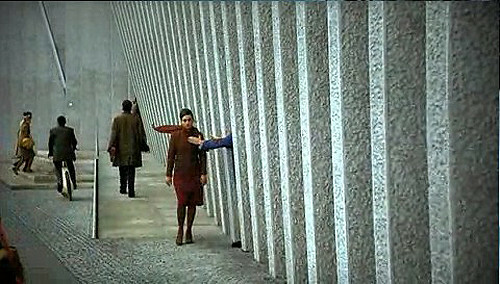 Numerous scenes in the film were shot in the Tierschutzheim Berlin (2000-2001) by Dietrich Bangert, above. The building is actually a large, privately-funded animal shelter complex. Berlin’s modern concrete and glass Mexican Embassy, above, was a public marketplace in the film. 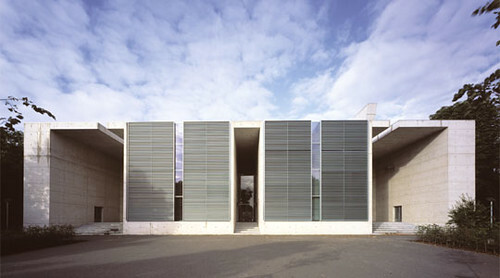 It was designed by Francisco Serrano in collaboration with Teodoro González de León and completed in 2000. The Volkspark Potsdam, 2001, popularly known as the BUGA Park, also includes the biosphere used as a tropical greenhouse in the film. 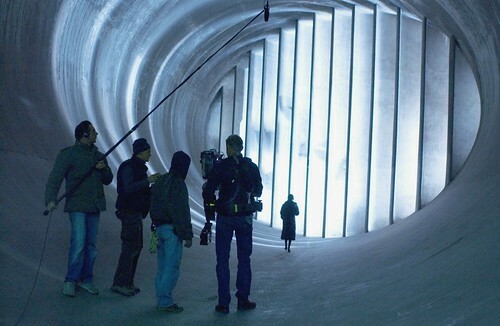 Its recreation area, with standing concrete planes, appeared during the assassination mission sequence. 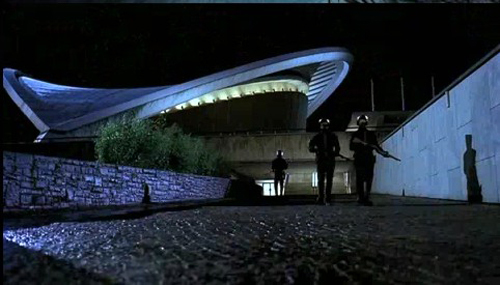 The scene above was shot at the Radsporthalle (Velodrom) by Dominique Perrault at the Landsberger Allee in Berlin Prenzlauer Berg. 1995-96. Bauhaus Archiv, which served as the exterior of the building where Aeon and her sister Una live (the imaginary interior, probably just a studio set, is directly above). From the Bauhaus Archiv website: “The museum building is a late work of Walter Gropius [1883-1969], the founder of the Bauhaus. It was planned in 1964 for Darmstadt and was built 1976-79 in modified form in Berlin. Today, its characteristic silhouette is one of Berlin’s landmarks.” More information about the images below is forthcoming, once I figure out where they were shot. Anyone? Complete list of locations below. This entry was posted on Wednesday, June 24th, 2009 at 11:58 am	and is filed under architect, architecture, design, favourite, furniture, interiors, landscaping. You can follow any responses to this entry through the RSS 2.0 feed. You can leave a response, or trackback from your own site. I love the lighting in that scene with Aeon’s sister. The architecture definitely helped the movie I think. I love it. I just saw this movie on TV. Never heard of the movie before that. I was so struck by the architecture that I googled about the filming locations and found your website. Thank you the lovely photos and information about the buildings. 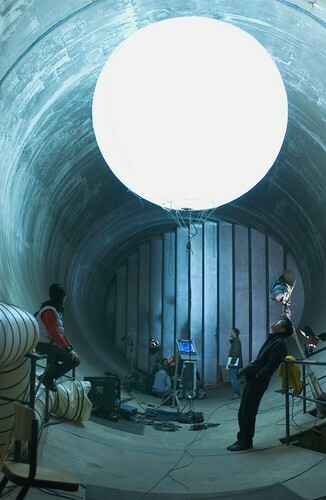 There is an aerial scene in the movie that showed a star shaped building and another that shows actors walking through a passage with brick vaulted ceiling. Do you know what buildings they are and where? Thanks. I don’t know! Does anyone know? I’m a student of architecture and i was really enchanted by the aesthetic looks of the places and buildings used in the movie.I was searhing about these places and just found your website.Thank you for making this list. 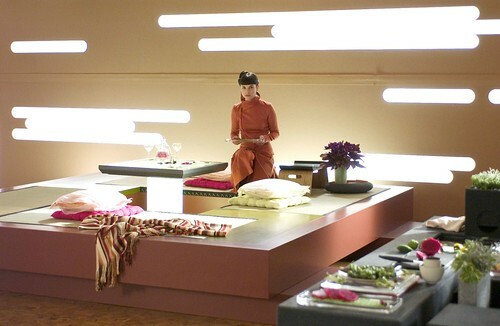 I also love the aesthetics of the movie, especially the interior design (like the kitchen pictured above). I don’t know a lot about architecture, but I really enjoy it a lot, and I have a soft spot for certain materials like wood and concrete. Maybe I should take a class on it or something, someday.